INFJs take their energy from the inner world of thoughts and emotions. They prefer dealing with patterns and possibilities, particularly for people, and they make decisions using personal values. 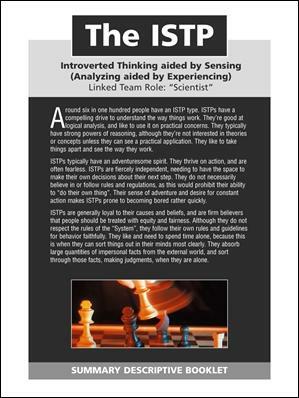 Psychological Type Indicator (PTI) booklets provide an easy-to-understand reference for this type (based on Carl Jungs psychological type theory). Each booklet also includes a one-page overview on each of the four relevant preferences. These pages make suggestions regarding time management, conflict, careers and general personality hints.